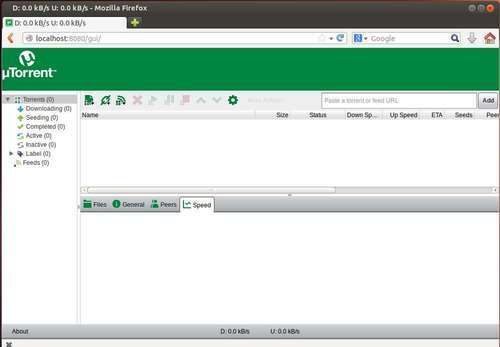 This tutorial shows you how to easily install uTorrent sever on Ubuntu and Linux Mint. There’s no command, just a few clicks! First, download uTorrent server: http://www.utorrent.com/downloads/linux. Check 32-bit or 64-bit by top-right corner shutdown menu (gear icon) -> About This Computer. After downloading, navigate to the package in Nautilus file browser. Then decompress it. Go into the extracted folder, right-click on utserver and select Properties. 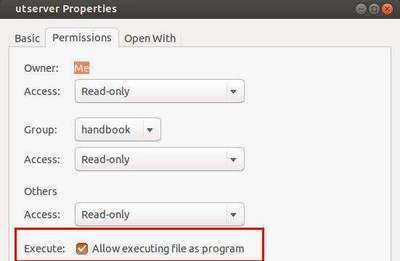 Make sure that the box before “Allow execute as a program” is checked. Before starting this service, search for and install libssl0.9.8 (SSL shared libraries) from Ubuntu Software Center. Then double click utserver to start uTorrent server (or run ~/Downloads/utorrent-server-v3_0/utserver command to start it). That’s right you see nothing happens because the server is running as a background program. When i try to go to “http://localhost:8080/gui/” it says it does not exist. What am I doing wrong? Got it installed and everything looks great. Rather than post this, I should just check it out first, but I confess, I over think stuff and would like to ask, anyway. To wit: can I get it to run magnet links by default? If I have to go the the Firefox preferences, I don’t see where I can use uTorrent, since it’s not actually a runable program as such. and yes magnets are supported by default. Thats how utorrent is awesome. Diego were you able to solve this? I can install ok in Lubuntu 14.04, and get to the login page in the webgui, but after putting in the username, nothing happens. Any thoughts? Nothing happens when clicking utserver. utorrent server will be running silently, just go to the webpage in your browser and see if the client available. Sorry if is stupid this question but i’m new on this so… From where did u get utserver?! I don’t get it so please help me!! From the link in the top of this tutorial.